马勇, 杜国义, 周松, 刘冠纯, 杨顺林, 王海峰, 张懿晖, 杨建明, 姚剑坤, 崔树学, 谢树军. 河北省1950-2013年动物鼠疫流行特征调查分析[J]. 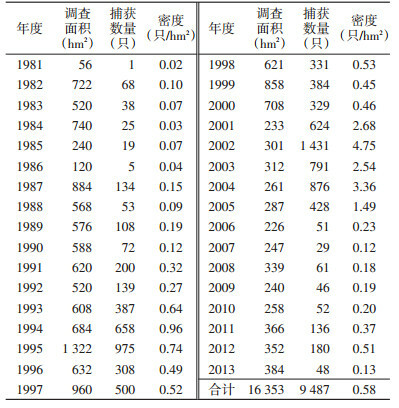 中国媒介生物学及控制杂志, 2018, 29(3): 293-295. MA Yong, DU Guo-yi, ZHOU Song, LIU Guan-chun, YANG Shun-lin, WANG Hai-feng, ZHANG Yi-hui, YANG Jian-ming, YAO Jian-kun, CUI Shu-xue, XIE Shu-jun. 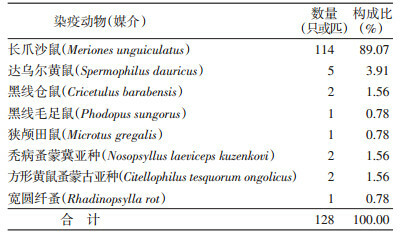 Study on epidemiological characteristics of animal plague in Hebei province, China[J]. Chin J Vector Biol & Control, 2018, 29(3): 293-295. Corresponding author: DU Guo-yi, Email:dgyhbs@163.com. Abstract: Objective To explore the epidemic factors of animal plague in Hebei province, China, and provide scientific basis for the prevention and control of plague. Methods The materials were collected and rodents were tested by "four step test" of plague, and the fleas were tested by group method or single stomach pulling method. Results A total of 240 358 rodents were tested, and 123 positive plague materials were found. Five of 14 856 vectors tested positive for Yersinia pestis. There were 7 animal plague prevalent years in Hebei province. Conclusion The prevalence of animal plague epidemic occurred intermittently in plague natural foci of Hebei province, the main change of hosts was a primary cause of animal plague, especially the gerbil density in animal plague epidemic years. 王治宇, 高文林, 史献明, 等. 达乌尔黄鼠及其寄生蚤的杀灭研究[J]. 中华卫生杀虫药械, 2012, 18(1): 57-58. 杜国义, 史献明, 董国润, 等. 鼠疫血清学研究进展[J]. 中国媒介生物学及控制杂志, 2009, 20(1): 91-92, 94. 杜国义, 史献明, 董国润, 等. 河北省康保县50年鼠疫防治工作概述[J]. 中国媒介生物学及控制杂志, 2008, 19(6): 591-592. 王海峰, 杜国义, 史献明, 等. 河北省鼠疫自然疫源地鼠疫菌生物学特征的研究概述[J]. 中国媒介生物学及控制杂志, 2010, 21(6): 638-639. 刘合智, 刘满福, 白万翔, 等. 河北省鼠疫自然疫源地自然感染鼠疫动物的研究[J]. 中国地方病防治杂志, 2005, 20(4): 225-226. 杜国义, 史献明, 刘合智, 等. 河北省鄂尔多斯高原型鼠疫菌毒力试验[J]. 地方病通报, 2007, 22(2): 14-15. 刘合智, 杜国义, 白雪薇, 等. 河北省鼠疫耶尔森菌毒力测定[J]. 中国地方病学杂志, 2007, 26(5): 478-480. 杨顺林, 史献明, 董国润, 等. PCR用于鼠疫陈旧脏器标本检测的分析[J]. 疾病预防控制通报, 2011, 26(5): 13-14, 25.